"The much hyped �king title� for the Xbox has arrived. Does it live up to the excitement?" Having a lot of publicity about a game can be a dangerous thing. There have been (and still are) a number of titles that have received much hype and publicity only to be launched with a lukewarm response � Munch�s Oddysee, Tiberian Sun, and Duke Nukem Forever all come immediately to mind. 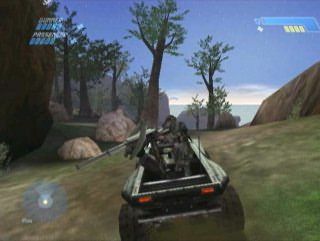 Halo has received an inordinate amount of exposure for the years leading up to the Xbox (even when it was going to be a PC title, it was being featured as the next big thing). When the Xbox launched in the US last year, the press was unanimous � Halo was worth the Hype. I�m sure Bungie and Microsoft were much relieved. However, when you first start up this game, because there has been such an undisputed endorsement of it, you�re expecting something that is going to make you drool, that is going to revolutionise the way you play games, that is going to set the new benchmark of gaming pleasure. Let�s dispel that myth right now, and say you won�t drool� not at first. Once you figure out what the hell is going on, and you get the hang of the controls, and just how big and open some of the initial levels are, you then start to look around at the environments and begin to appreciate how nice this game is. When you DO get over that initial period, and commence �graphics appreciation� mode, it�s a similar feeling to that this reviewer got when he first saw the outside level in Unreal with the awesome sky and waterfall. Of course, our senses have dulled since then with so many other beautiful games being released in the interim, so for Halo to generate that same feeling says something indeed. 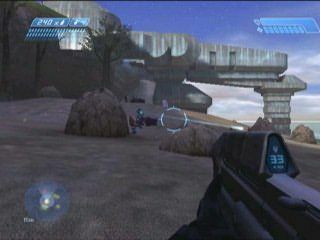 The first level of the game is set within a spaceship under attack. Since it�s mostly corridors you could expect it to be unimaginative. However, because of the attack, beams and crates are everywhere, and as you fight your way to an escape pod, you�ll come into contact with clusters of marines and aliens in huge firefights. The soldiers need you to help them out, and this of course you�re most happy to oblige. 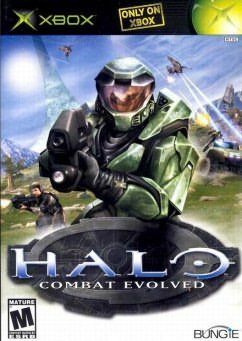 Once you arrive on the planet (and I�m being deliberately vague here so as to not spoil anything for you), you�ll begin to find out why everyone loves Halo. The waterfall, vegetation � heck even the grass! � is rendered and textured beautifully. Rock formations and the cliff faces have an incredible amount of detail on them, and the ground is a naturally undulating splendour. As you progress through the world of Halo and find more and more to deal with, it can get a little overwhelming. Your guide will tell you to go and do such-and-such, but you can be forgiven for thinking, �and where might that be?�. Using surround sound can help in this area (see below), but even then you can have difficulties at times. After you�ve demolished your share of alien Covenant blood, you�ll discover something that distinguishes Halo from other shooters � you can only carry two weapons at a time. Yes, you can be armed with one, and have another one holstered and that�s it. Not only does this add a bit of realism that other FPS games don�t have with their ability to have all 9 or 10 guns, but it adds a level of strategy that makes it even more enthralling. Will I keep the M90 Shotgun, or toss it in favour of the Covenant Needler? On to the Warthog, and this is an important feature that cannot be overlooked. At certain points in the game, you�ll have a chance to hop in one of four different vehicle types. The first one is arguably the coolest � the Warthog. This all terrain vehicle takes three personnel � the driver, a passenger and someone in the rear manning the gun. In single player mode, the driver seat is where you�ll want to be so that you can direct the action. The control interface is very different and the way the Warthog handles may be offputting at first, but it really doesn�t take long before you�ll be taking corners like a pro. You have the ability to jump out at any time too, and it�s here that Halo shows how to combine different gameplay elements seamlessly and realistically. Speaking of the controls, mention must be made about how well Bungie did on getting the interface right. 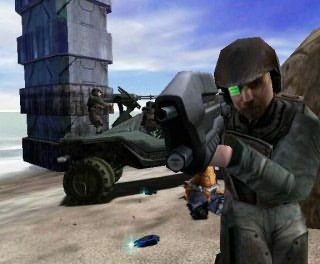 Up until now, TimeSplitters for PS2 would have to be the benchmark for setting the controller up for optimum playability for a FPS game. Now, however, Halo has to take that crown. Of course, the button configuration on the Dual Shock and the Xbox controller is completely different, but it just feels so right on the Xbox controller. In fact, if you�ve just bought an Xbox and are having a little difficulty getting used to the large size of the controller, I�d advise you to play Halo for a couple of hours. It will give you a full appreciation of how it works and it will feel much more comfortable after a session like that when you realise how the buttons will work. There is SO much more to be said about Halo, but we�ll just cover one more highlight � Multiplayer. As is the case with most FPS titles, the multiplayer aspect is well thought out and awesome to play. Halo has an awesome range of ways of dealing with your mates, with more than 20 default game types available. The main categories include Capture The Flag, King of the Hill and even Race (where you get to race in Warthogs � very cool). With one console you can have up to 4 players playing split-screen, but with the ethernet ports built-in to the Xbox consoles, you can have up 4 Xboxes playing simultaneously. For the mathematically challenged, that�s 16 players at once. We�ve got just a couple of down points so you know what you�re looking at here. Firstly, while the sound is absolutely fantastic, expect to get frustrated without full 5.1 surround sound. Because the levels are so open and you often work with a team of other soldiers, you can get into a situation where you hear them call out to you to help. With surround sound, you can actually determine where exactly you need to head, but if you�re just using your TV, expect to be repeatedly confused as you try to work out which soldier needs you. Because the framerate is set at 30fps, there will be times that you�ll notice a telltale stutter. This particularly happens in the introductory movies and other FMV sequences, where a noticeable pause can occur as frequently as every 5 seconds. Multiplayer can also suffer ever so slightly from slowdown. In conclusion though, once you get past the initial bewilderment of being in a game world that�s so big, and accept the fact that you�re going to miss out on some of the game�s richness if you don�t have surround sound, this game is one of the best available on the Xbox. In fact, it�s actually one of the best FPS games on the market at the moment, and with the awesome number of multiplayer game types, you�ll never get tired of showing your mates just how good you are. If you have an Xbox and don�t own this game, you should probably be shot. With an MA5B Assault Rifle.